Moth makes no fancy claims for their Mains distribution block, pointing out, however, that unless you have a vast number of sockets fitted next to your hi-fi you will need some kind of distribution board and the more capable this is the better. The Mains distribution block, available optionally with six or ten outlets, is housed entirely in steel and wired with exceptionally heavy-gauge copper. The flying lead is by Supra and is screened, making the whole assembly unusually resistant to receiving and transmitting radio-frequency interference. There is no filtering inside, just wire, and the sockets are good-quality units. Usefully, the back plate is extended and has holes to facilitate fixing to the wall. Used to feed a basic single-source system, this board helps the sound escape from its cage somewhat, giving a subtle extra amount of space to images and once again improving focus overall. When we tried swapping equipment around, we soon found that high-current devices appreciate this block, especially high-power, solid-state amplifiers. These seemed unusually keen to dispense power, giving the sound a fillip in the dynamics department and also suggesting, at times, that bandwidth is improved, especially during loud musical passages – there's no sense of this when the music's quieter. We also thought we heard a trace more detail from a phono stage powered by a 'wall wart' supply, something we hadn't expected. 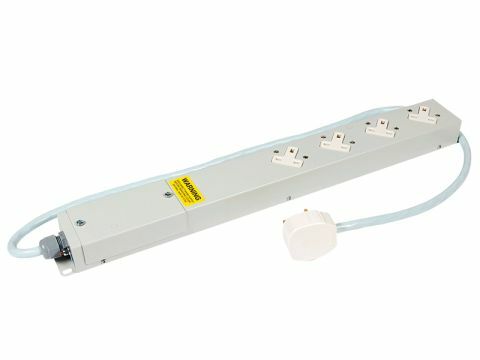 For units connected by an IEC lead, there was a very clear advantage in using a screened cable from the distribution block to the kit.